They work together to make great music soundtracks for your videos and media projects. What makes us unique? Our music tracks have limitless creative possibilities—thanks to our technology—with different sounds and arrangements…all for one low, buy-it-for-life price. The technology has won multiple awards and it’s easy to use—anyone can use it! 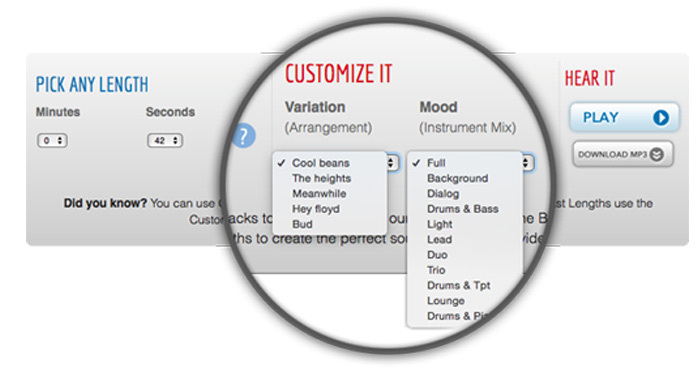 One option is to sign up for an account on our Quicktracks® Customization page and Get 5 FREE Tracks that you can start customizing today! Or try our desktop software for even more control and more creative options… You can Learn More about Sonicfire Pro 6 by Downloading our Free Trial. It comes with 5 Free Tracks you can use on your video projects—permanently—today. Or, simply start by getting to know our great library of thousands of Royalty-Free Music tracks. You can Search or Browse our creatively flexible music. You can purchase by the track, or for more value, by the album or choose one of our several super-discounted music packs - and creatively customize your music for life! With SmartSound music and technology there are infinite creative possibilities available for the music in your media productions.